The Atlantic Alliance Turns 70: What Future for Europe? Humanity is increasingly caught up in the maelstrom of new conflicts. Disorder in the world is growing. A great war can no longer be ruled out. The global conflicts have nothing to do with territorial claims or conquest, as in earlier centuries. No state today seeks territorial expansion, not even Russia, which laments the collapse of the Soviet Union; the events in Crimea in 2014 were a response to NATO's eastward enlargement. Notwithstanding these grandiose and unrealistic objectives, not even the rhetoric of European autonomy was on display in Washington. Indeed, what was said—and left unsaid— reflects that fact that Europe’s global power has descended to its lowest point since the Suez Crisis of 1956. Caught in the crossfire of Sino-American rivalry and trapped in a German-led austerity union, European nation-states are likely to fall further. Notwithstanding Trump’s initial anti-NATO rhetoric, during his administration the alliance has continuously expanded its operations and global footprint. NATO member states recently reaffirmed unequivocally the 2008 Bucharest Summit decision that Ukraine and Georgia will eventually join the alliance, and before traveling to Washington Stoltenberg attended 12-day NATO-exercises in Georgia. NATO has deployed combat-ready battalions in the Baltics and Poland, where more than 4000 US troops are stationed and discussions are taking place on a permanent US base. It has stepped up naval activity in the Black Sea and provided lethal weapons to Ukraine. 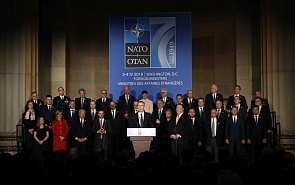 In important respects, moreover, NATO has been transformed into a global alliance, enabling the United States to carry out military operations in Africa, Asia, and the Middle East through a network of bases and “lilipads” in 41 “partner” states. Following President Jair Bolsonaro’s visit to the White House in March Trump declared that Brazil should be considered for NATO membership. The foreign ministers could not ignore two serious conflicts within the alliance. Vice President Pence reaffirmed US opposition to the NordStream 2 pipeline, proclaiming that it “could turn Germany’s economy into literally a captive of Russia.” Germany has already made significant concessions by constructing two terminals to import LNG and conceding that gas will continue to transit from Russia across Ukraine. Nevertheless, there can be little doubt that NordStream 2 remains a “red line” for the German state and also for German industry, whose competitiveness would be diminished if compelled to import more expensive LNG from the United States. This was confirmed by Berlin’s decisive response to Macron’s unprecedented threat to bring the project under the Commission’s control unless France obtained an increased Eurozone budget, one more sign of the demise of the Franco-German partnership. Turkey’s refusal to abandon its commitment to purchase the S-400 air defense system from Russia threatens its membership of NATO and the viability of Incirlik Air base with its stockpile of tactical nuclear weapons. In Washington, Turkish Foreign Minister Mevlut Cavusoglu insisted that the “S-400 deal is a done deal.” However, the United States has threatened to cancel Turkey’s participation in the F-35 jet fighter program, an important industrial project, and is almost certain to enact draconian sanctions against Turkey’s already fragile financial sector if it proceeds with the purchase. Washington is unlikely to acquiesce in Turkey’s decision, but it will be difficult to find a compromise as Turkey moves towards broader cooperation with Russia. ﻿The ambivalence of the NATO position is actually increasing compared to during the 2000s, when the organisation focused on the military operation in Afghanistan. The alliance has turned out to be a military bloc, but lacks proper military tasks. Haunting the European ministers in Washington was the specter of China. Even as the EU Commission was formulating a more hawkish line on trade with China—prompting Macron to declare a “European Awakening”—Italy became the first G-7 member state to sign up to the Belt and Road Project. Following the EU-China Summit on April 9 the EU claimed that agreements over curbing subsidies, forced technology transfers, and market access in the final communique represented significant Chinese concessions. However, following the EU summit China now holds a second summit in Croatia with the 16+1 grouping, 11 of which are EU member states, highlighting European division. There is growing interest in a comprehensive NATO response to China, first proposed by Stoltenberg at the Munich Security Conference in January, and reaffirmed in Washington by US and German officials. Such a response would correspond to the nascent trend towards bifurcation resulting from the US containment strategy. The United States and the EU have cooperated in the WTO against China and they continue to uphold their arms embargo. However, German business maintains a massive, if tenuous, presence in China. Europe is far more vulnerable to a trade war with China than the United States, and therefore less willing to challenge Beijing, as, for example, with respect to US pressure to exclude the Chinese telecoms giant Huawei from 5G networks. At the same time, transatlantic cooperation continues to be overshadowed by trade conflicts and Trump’s intransigence. Even as NATO considers a China policy, at the present time a declining Europe remains caught between the two economic superpowers, unable to act strategically but ultimately subordinated to the United States.